Status: Common, locally abundant, regular resident statewide. Documentation: Specimens: ZM-18428 (female) and 18429 (male), 29 Nov 2005 “found dead one day after blizzard” in Bassett, Rock Co.
Taxonomy: There are two subspecies in the native range of this species: decaocto from Europe to western China and Korea, and xanthocyla in Burma and eastern China (Clements et al 2016). Putative hybrids between this species and Mourning Dove have been reported in North America, but seem to be rare. Two candidate birds at Bushnell, Kimball Co 2 Jul 2009 were the size of Mourning Doves, but were pale and lacked a nape mark. Convincing pictures of a likely hybrid in Tennessee have been published online (Wilson 2018). It seems reasonable to assume that as numbers of Eurasian Collared-Doves have increased, the need to mate with other species would decline. Numbers of wild birds may be augmented on occasion by released Ringed Turtle-Doves (see that species). 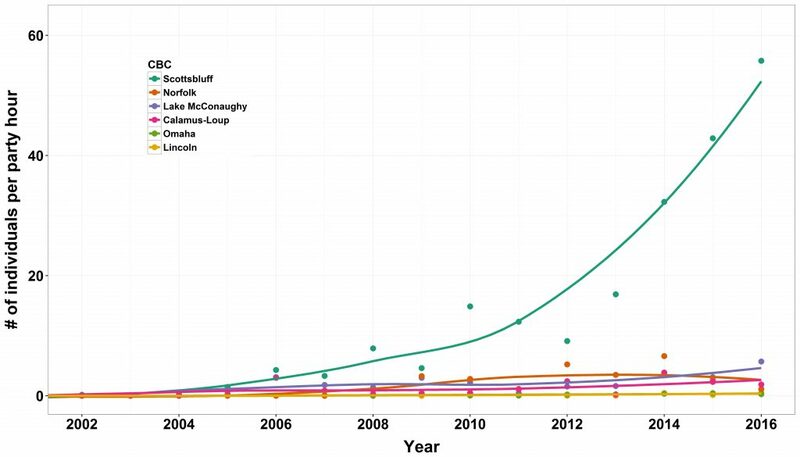 Changes Since 2000: This species has expanded its range and numbers have increased dramatically in Nebraska since 2000 with largest increases occurring in western Nebraska (Figures 1 & 2 in Appendix). Resident: Arrival, range expansion and increase in numbers by this species in Nebraska was discussed by Brogie and Silcock (2004). As of Mar 2001, it was “now residing in many of the larger towns in the Panhandle” (Stephen J. Dinsmore, personal communication), and occurred in numbers in and near Kearney, Buffalo Co. By spring 2004, it had been reported in 77 counties (Brogie and Silcock 2004), the main exceptions being in the Sandhills; the final county to record the species was Keya Paha, on 18 Feb 2007. In 2008 it was considered “common”, even in the Sandhills, although as of spring 2017 there are still few reports from Cherry Co. It is by far most common in rural towns in western Nebraska and has only become noticeable in Omaha and Lincoln neighborhoods since about 2006. The first state record was of one at a feeder in Shelton, Buffalo Co 29 Nov 1997 (Brogie and Silcock 2004). The second state record and first breeding record was of a pair in Kearney, Buffalo Co 22 Apr 1998. These birds fledged two young by 19 May and then re-nested, and by 24 Sep as many as nine birds were present in the neighborhood. Nesting was attempted in Oct and Dec but was unsuccessful. Eight birds were still present Dec 1998-Feb 1999, and “lots” were reported into spring 2000. Since these initial records, numbers have increased dramatically, most notably in the west; CBCs in winter 2016-2017 reflect this distribution, with Scottsbluff reporting 1359 on 29 Dec 2017, a new count high, while across the state totals were North Platte 166, Harlan County Reservoir 50, and Omaha 33, the latter a new count high. High non-CBC counts are 1500 at Kearney, Buffalo Co 2 Jan 2019, and 1000 there 26 Dec 2017, and in the east a new high count was the 231 at a grain elevator in Lincoln, Lancaster Co 28 Sep 2018. This species, like Rock Pigeon, may attempt to nest almost year-round, but mostly in Feb-Oct (Romagosa 2012). Four broods were raised in a Sidney, Cheyenne Co yard in 2006. Comments: Escaped and released birds of the nominate subspecies decaocto (Romagosa 2012) on New Providence, Bahama Islands, in 1974 spread rapidly thereafter in the northern Caribbean and to Florida by the late 1970s (Smith 1987). Subsequently it has spread northwestward on the Great Plains and was first discovered in Nebraska at a feeder in Shelton, Buffalo Co 29 Nov 1997 (Brogie and Silcock 2004). A specimen shot by a hunter in Stanton Co 16 Sep 2000 and mentioned in Brogie and Silcock (2004) cannot now be located. Photograph (top) of an Eurasian Collared-Dove at Papillion, Sarpy Co on 11 Apr 2011 by Phil Swanson. Figure 1. The number of Eurasian Collared-Doves recorded per party hour at selected CBCs in Nebraska. Points represent reported values and trend line created using locally weighted scatterplot (LOESS) smoothing. Data collected by volunteers and provided by National Audubon Society and the Nebraska Ornithologists Union. The Scottsbluff CBC has recorded markedly more birds and has seen a far greater rate of increase compared to other CBCs. Figure 2. 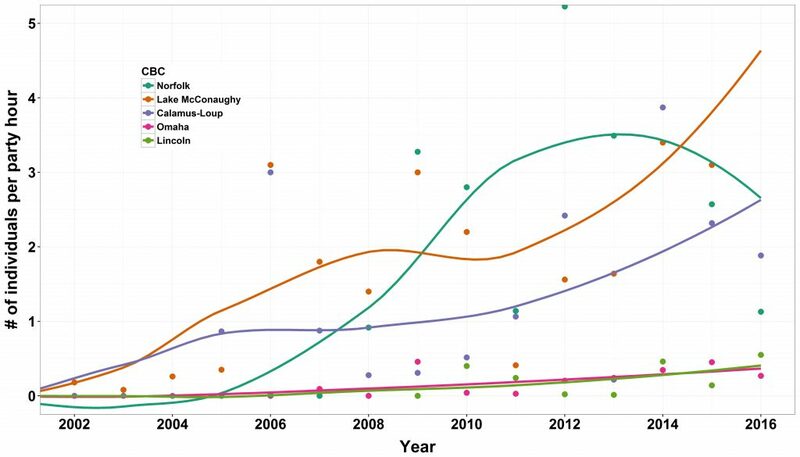 The number of Eurasian Collared-Doves recorded per party hour at selected CBCs in Nebraska. Figure 2 includes the same data as Figure 1 with the exception that the Scottsbluff CBC is excluded. Points represent reported values and trend line created using locally weighted scatterplot (LOESS) smoothing. Data collected by volunteers and provided by National Audubon Society and the Nebraska Ornithologists Union. The graphic shows that larger increases have occurred in the west and central and increases have been smallest in the east (i.e., Omaha and Lincoln CBCs). Brogie, M.A., and W.R. Silcock. 2004. Eurasian Collared-Dove (Streptopelia decaocto) expansion in Nebraska: 1997-2003. NBR 72: 18-23. Smith, P.W. 1987. The Eurasian Collared-Dove arrives in the Americas. American Birds 41: 1371-1379. Wilson, J. 2018. ECDO-MODO – single.jpg and ECDO-MODO – group.jpg, accessed 8 February 2018.